It has the be said that the vast majority of fans at all non league grounds are first class.That’s why they follow the pure brand of the game.But there have been some class mallets at several of the places we have visited. 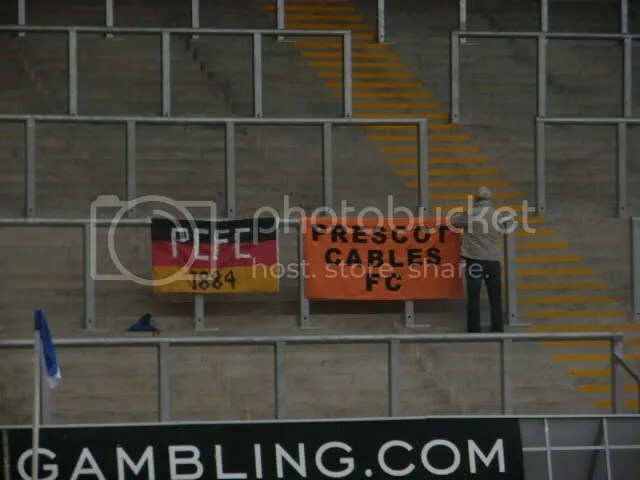 They usually work under the assumption that Cables are a ‘scouse club’ and take it from there.Just for a laugh guys…. Frickley:These guys still think the miner’s strike is still on judging by their tactics hairstyles and clothes .That’s the miner’s strike of 1906. Buxton: Tanked up students sing tales of using our heads as coconuts at the funfair while drinking half a shandy.Oh we did Laff. Kendal: Farmer Palmer and the gang come down from the hills fresh from Making their own Brokeback Mountain Video to give it large about Cables poor league form.Then they went home to milk the livestock. Sometime way back in 1884 a group of lads picked up a ball on a plot of land somewhere in Prescot. So the long story of Prescot Cables FC was born. I doubt those young men envisaged that moment would leave quite such a legacy for the small Lancashire town of Prescot. They say it’s always difficult to recognise history when you are actually a part of it. Someone once said “History must be written of, by and for the survivors. “ Well in that case we are still here, still surviving in possibly the harshest environment for non league football there has ever been. The club has survived the Great Wars, having to use other grounds , and the usual slings and arrows of outrageous fortune. Several years ago the club was pulled back from the brink by a group of selfless supporters who refused to let Prescot Cables FC become just another part of Prescot to vanish. Are we having fun yet? Bamber Gasgoigne leave Cables pointless and clueless after a pretty harrowing home display by Cables. The first half is typically edgy and tight with very few chances, the second half more open with Bridge creating several chances and Cables creating nothing much at all.All the action from a Cables point of view comes in watching the heavyweight contest between Joz Mitten and Bamber’s gangly number 5, there’s more sparring than you’d see in a Tyson versus Holyfield fight. With Cables creating nothing any Bridge goal is likely to prove decisive, and so it proves.A couple of Cables defenders get in each others way allowing a pretty easy cross and routine finish- end of contest.They do score another near the end but it’s pretty moot, Cables wouldn’t have scored had they played until the arrival of The Messiah…….and I wish he’d hurry up, we could do with a bit more power in that midfield. Woodley is a horrible ground, no atmosphere, no character, no crowd and worst of all no bloomin’ grass! I have never watched a live footy match played on a synthetic surface and I wasn’t really sure what to expect. On closer inspection the synthetic surface is similar to the stuff covering green tinsel at Xmas. It looks pretty inocuous while the teams are warming up, however that all changes when the match starts. The artificial surface starts to resemble a very taut trampoline with every ball that bounces out of play being lost over the fences or the stand. The floodlights too are poor and there are not only shadows on the pitch but the nap of the surface shimmers…..not sure what the players make of this but as a spectator it is very annoyingly distracting, like watching seaweed at high tide. Having observed that, the Cables faithful expect the ball to be kept on the ground and played to feet…..unfortunately the team opt for the long ball from the back which, unless it is headed goalward by a forward, bounces heavenward and out of the stadium. Not so much like watching Brazil…..unless Brazil have a ping pong team, made up of tigger wannabes. Another bad day at blackrock!